The Guldra are a mysterious and enigmatic race. These rarely seen creatures wander the desert in small groups and dwell in stone houses deep in the desert. 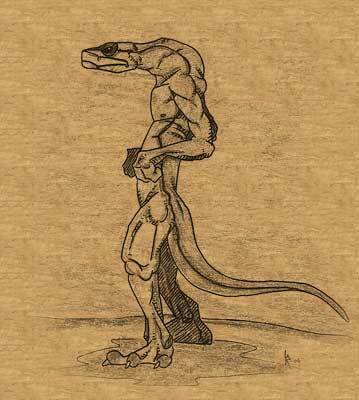 The guldra are tall and slender, brown skinned reptilian humanoids that vaguely resemble walking snakes. They are covered in glossy, brown scales much like a snake’s skin. They have flexible spines that flow into long snake-like tails. Their long limbs appear delicate, but are actually quite strong. Their heads are hooded much like the cobra. Guldra walk on three toed feet and manipulate tools and weapons with three fingered hands. The average guldra warrior stands 2.5 meters tall (8 feet), but only weighs about 175 pounds. Often they wear no clothing, only weapon harnesses and tool belts. They are found in the deepest regions of the Ahtabi Desert. Very little is known of their culture. They speak a strange language of hisses and clicks. Some ten years ago, a desert caravan vanished while on the road. Days later, one of the caravan drivers stumbled out of the desert half dead. He told a tale of how the guldra attacked the caravan and took prisoners to one of their towns. He was able to offer some insight into the Guldra culture. He described the guldra hive community as a massive fortress made of sandstone. The fortress was built around a huge central quarried pit hundreds of meters across. Tiered paths circled the pit and numerous caves pierced the walls. Most of the caravan prisoners were sacrificed in horrific rituals to a “snake god” the guldra worship. He managed to escape during a sand storm and used it for cover. He wandered for days, fevered and incoherent, before encountering a small group of civilized travelers. After being rescued and relating his story, the man died from some strange poison coursing through his veins. The guldra seem to have a caste society that involves at least three castes: warriors, wizards and rulers, although there may be more. Their wizards have been seen to cast a number of spells that control and manipulate the sand of the desert. They also imbibe a strange yellow liquid which strengthens them and seems to fuel their magic. Their warriors wear weapon harnesses and fight with long wooden staves with curbed blades on either end. Guldra have been seen eating strange balls made of strips of red meat. In actuality, these "strips of meat" are worms, called s'shudeska in their language which translates roughly as "water worm". These ugly thick red worms are a common part of the guldra diet. It is speculated the worms have a high water content and great nutritional value. The Guldra eat them whole and alive.